Bake a round cake the size that you need. Ice the cake in white icing making sure the surface is nice and smooth. Using a green food color spray (also known as color mist), spray the top and sides of the cake a light green. With an icing filled bag and round tip, size #5, draw the chick and egg on the cake top. Use a star tip, size #18 to do all of the fill in work and a round tip, size #5 to do the outline work. Make a small amount of orange icing and fill in the beak of the chick. With white icing, fill in the cracked egg and the eyes of the chick. With a bright yellow icing, fill in the chick's body. Use a black icing and round tip, and do the outline work on the chick and egg not forgetting the dot on his eyes. 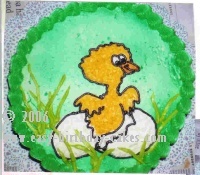 Now make a yellow green color icing and use leaf tip, size #352 to make grass tufts around the chick and egg. To make the grass tufts, just pull quickly as you squeeze the icing bag lightly. Now change the tip to a star tip, size #18 and make a shell border around the top edge of the Easter cake and the bottom edge of the sides.